Saturday, December 12th. That was the day the office began the process of moving. We had to come in early so we could supervise the movers, who were slated to arrive at 8 a.m., and finish packing. 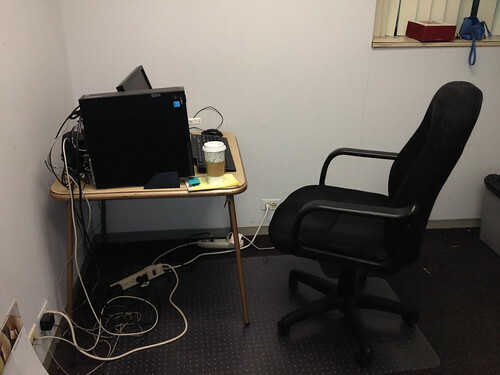 Here was my space for 10 years. This was the northwest corner. A lot of stuff wound up shoved onto the shelves. The former boss was well known, within the company, for saving everything. "Oh you'll have a need for this some day," he'd say. Never mind that new technologies made instruction books for old equipment obsolete or that the company developed newer PR materials. You couldn't toss anything unless you did it on the sly. By this date, obsolete stuff had been purged off the shelves leaving only the things we felt we wanted to save or were my items. 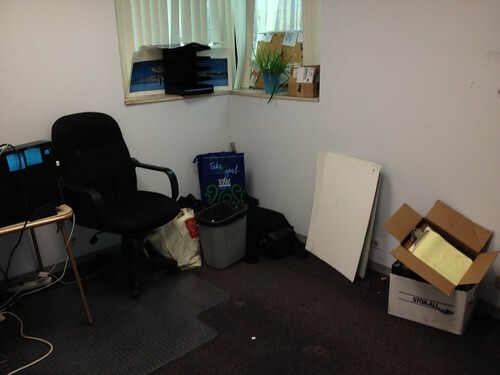 This is the southwest corner of the office, with my leaky windows. The corner sill was great for displaying photos and mementos. 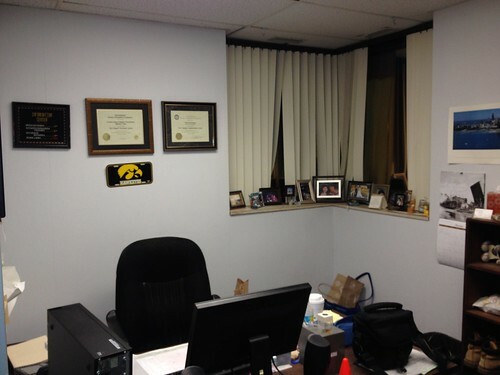 There are two certificates of excellence and a cross-stitch above the Hawkeye "license plate". My desk was something of a mess. Even knowing I was moving didn't really improve the piles of stuff. I know the aphorism, "A messy desk is a sign of a creative mind", but I do need to be able to find things without having to move stuff to the floor. And here's the door to the office. Some things just aren't going to be a part of the new office. There was a photo on the wall to the right, of the rear of cows and an approaching thunderstorm. I don't remember how long I've had it. It was a Christmas gift from people I haven't talked to in years. Giving that away. Most of the stuff taped to the door is gone. There is one photo, taken at Walt Disney World, which has been framed and is in my new office. 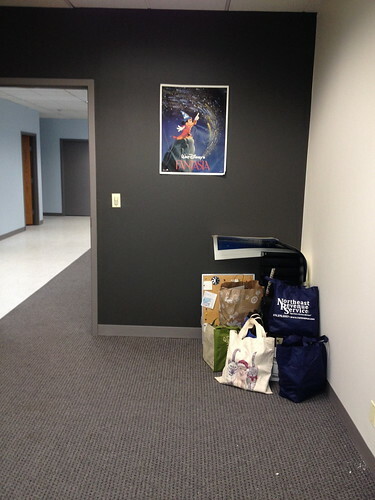 And there is the Fantasia poster. I got the materials to actually frame it and that's this weekend's project. Next week, it should, along with my certificates, the cross stitch and the license plate, be up on the walls in the new office. For 10 years, I've called this room my office. 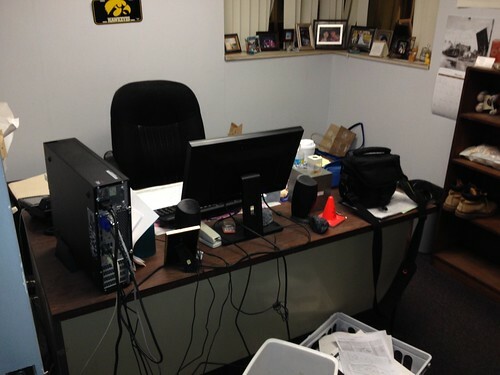 For 10 years, I've walked in here every day, walked around the corner of the desk and sat down to work. I started packing up the last of the things I really didn't need, taking down all my wall items. I wasn't sad. It felt like it was time to move on. We did not have internet at the new office. I would need to be in this space until that was hooked up. So, once I had removed everything from the desk, my computer was moved to a card table. This is my grandmother's card table. It comes with 4 chairs which are horribly hard to unfold and fold up so they stay in my basement until I'm really desperate for seating. It worked fine for the few days I needed to still be in this space. The only issue we had was cords. This mess was difficult to sort. This is why I love my Mac. One power cord. One cord to the keyboard and one cord to the mouse. I have a cord for my external hard drive and a cord to download my digital camera. And there is one USB slot left to plug in my cell phone if I want to charge it or download photos off it. 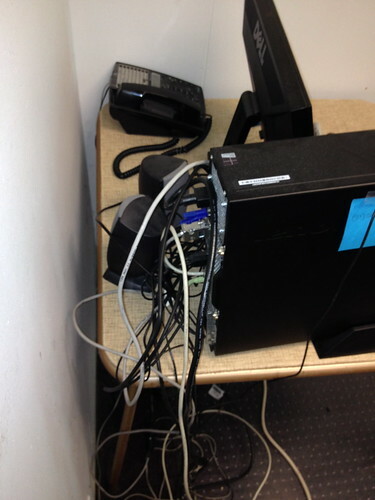 There is still a mess of cords in my new office. Thank goodness for zip ties. 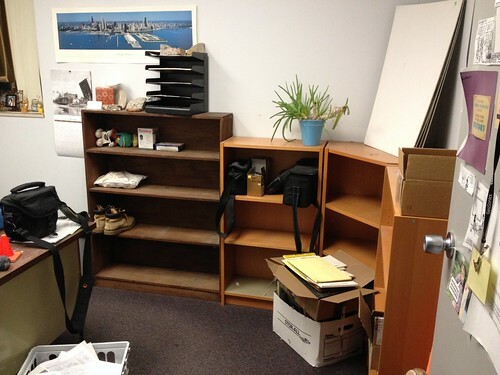 Once the movers were done loading things up, my office looked like this. I loaded up the Jeep and headed north to the new space. One load fit nicely in this corner. Yes. 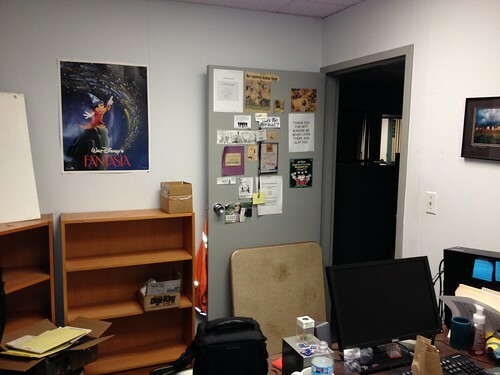 My Fantasia poster is going to look fabulous on this wall. Next step is painting the frame. One thing I won't miss. Doesn't look like much on the sill but those are ants. We've had a horrible ant problem for years. I think they have found their way into the walls and, when they do that, can be extremely hard to eradicate. I know from experience, but seem to have the home ant problems under control, thanks to Terro. I had water seep in one year after some particularly heavy rain storms. The carpet was soggy under the window. The building owner had to do some excavation by my office and caulk the windows. The water warped the cheap laminate on the sill so it bowed up. Ants would get under this in the spring. All I'd have to do is rattle the top and they'd come streaming out the junction between the window and the wall. Call the building owner and they'd come over and...spray. That's it. The ants would move from my office to Tara's, which was next to me. We finally decided we'd just put out Terro ourselves because the building seemed to not care. 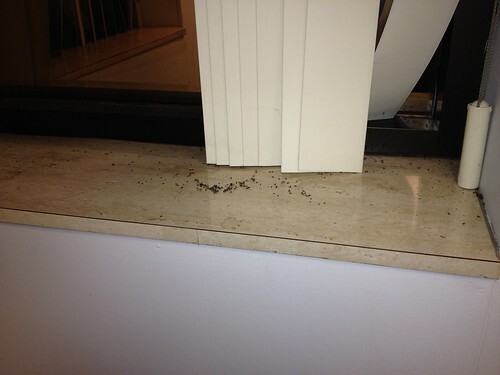 And the cleaning company would not dust the window sill, so if ants came out of the sill and died, well, they stayed there. Needless to say, I will not miss this battle at all. Sounds like you will be enjoying the new space and no ants!